My name is Pete, and I found a beautiful rock at the beach, in Imperial Beach (IB), on Friday, the third of July, 2015. I traveled down to IB from Mira Mesa to do some photography, which is my hobby, and I had just put my left foot on the sand when it caught my right eye. It was sitting on top of a wooden post just at the entrance to the beach. I stopped to see what it was, and when I read the words “choose joy”, I thought to myself, how kind. I left it where it was and I began to walk away, because I thought it may have belonged to somebody and they were letting it dry on top of the post. It was glimmering with the sun shinning on it, and I thought it was wet. I took about ten more steps on the sand when I realized that the rock was there for me to find. I turned back around, hoping no one else had seen it, and went back and picked it up. As soon as I picked it up, and just holding in my hand, it immediately put an enormous smile on my face and in my heart. You see, I love my hobby, and I usually go to the beach at Scripps Pier and photograph that pier, because it’s close to Mira Mesa. Oh, and it’s also beautiful there! But on this day, something told me to go to IB. Go figure! You have no idea how possessing that little shinny rock with those wonderfully painted words changed my entire feeling about the photography I was doing that day and into the night. Oh, I haven’t told you yet, at this point I still haven’t looked at the bottom of the rock. I didn’t do that until I arrived back at my house at 11pm that night. I kept it in my shorts pocket while doing my photography and I kept thinking to myself, choose joy, which kept a smile on my face and in my heart all night long. I stayed at the pier that night until the lights came on so I could make some night shots, and I titled the photo that I posted on my Face Book that night, “Choose Joy”… I just had to. Stop by and have a look if you have time. 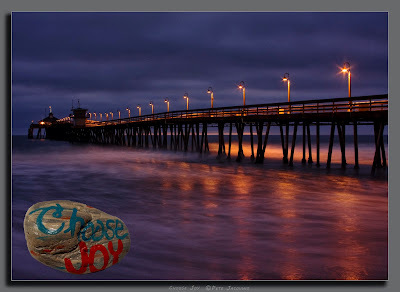 Well, here is the photo of the Imperial Beach Pier that I posted Friday night, and I have taken a picture of the rock and superimposed it into this copy that I’m sending to you. Thank you for helping me to choose joy! P.S. I’m going to hold onto this rock for a while, probably until someone needs it more than me.